KATHMANDU, Dec 23: The ongoing dispute between the Nepali Congress (NC) and the left alliance over the type of electoral system for the upper house has made the formation of the new government uncertain even weeks after the elections. Talks between the major political parties have failed to yield a consensus. After the CPN-UML, which swept the recent parliamentary and provincial assembly elections, opposed the proposed Single Transferable Vote (STV) election system for the National Assembly, the president put the STV ordinance on hold. President Bidya Bhandari finds herself in a fix with the UML urging her not to authenticate the ordinance and the government pressing for authentication without delay. The ordinance has been stuck at the president’s office since October 23. A meeting on Friday between leaders of the ruling NC, left alliance allies CPN-UML and CPN (Maoist Center), the Rastriya Janata Party Nepal and the Federal Socialist Forum Nepal ended inconclusively after the alliance and the NC remained adamant. NC has claimed that the way cannot be found for forming a new government without first electing the upper house. It has stated that the election of the upper house is a must prior to allocating House Representatives seats for the political parties under the proportional representation (PR) category. Citing Article 84 (8) of the new constitution, NC has demanded that the upper house election should be held first so that the parties can ensure at least one-third representation for women in parliament through PR. The article reads: At least one third of the total number of members elected from each political party represented in the parliament must be women. However, the left alliance is for allocating PR seats to the parties prior to the election of the upper house, which could pave the way for the formation of the new government by the left alliance that has just received a popular mandate. Stalemate between the two sides over whether the government or the National Assembly comes first revolves around securing more seats in the upper house. 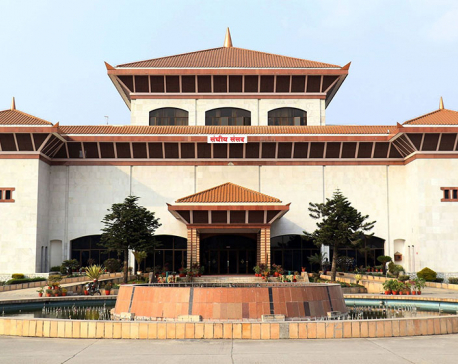 If the ordinance is authenticated, the NC is likely to get eight to 12 seats in the upper house. But a majority election system as demanded by the UML would mean the left alliance could secure eight more seats in the 59-member house. Prime Minister Sher Bahadur Deuba invited leaders of the three major political parties to his residence Friday to end the impasse but the meeting failed to reach to any conclusion after UML leaders reiterating their position. UML Chairman KP Oli demanded at the meeting that the ordinance be withdrawn by the government for a revision as it was unconstitutional. But NC leader Ramchandra Paudel demanded that the ordinance be authenticated by the president without delay. According to one party leader who was at the meeting, the Maoist Center was for finding a solution to the dispute through dialogue while the RJPN and FSFN were for STV . Meanwhile, Prime Minister Deuba and other senior NC leaders urged President Bhandari to authenticate the National Assembly ordinance at the earliest.